SpoCon 2017 happened. Read about it here. I read Station Eleven by Emily St. John Mandel for part of my Independent Study. It is now a strong #2 on “Michelle’s List of Favorite Books ever,” and I believe you should read it. 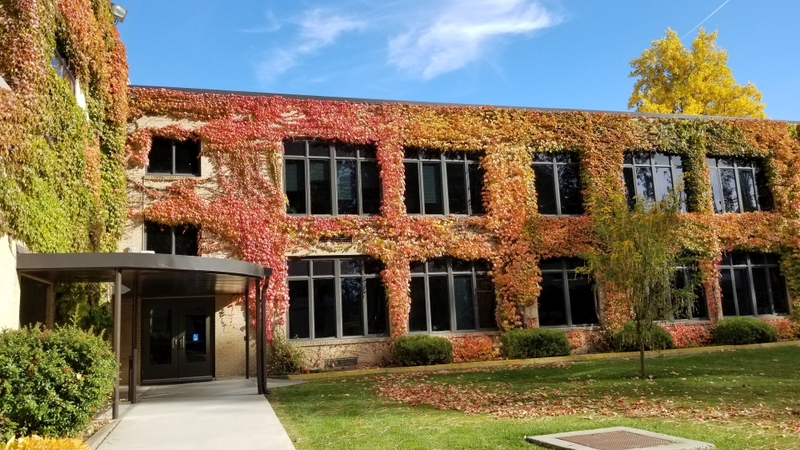 Fall 2007 semester at North Idaho College began. I was slated to take 12 credits and work part-time as a work study employee. Then I ended up adding a Poetry class and it became 15 credits… My classes included: English 102, Math 123, online Astronomy, Poetry and an independent study with my English teacher. We bought a gym membership in August and have not returned. I read Kraken by China Miéville. Eventually I had to switch over to the audiobook version because it became a bit too weird to read. By the end of the book, I loved it. Somewhere during this, Mason and I watched two of three Star Wars prequel movies which names I cannot remember. I laughed a lot. We signed up for MoviePass and have since watched Baby Driver, Spider-man: Homecoming, Blade Runner 2049 (we regretted seeing it), Thor: Ragnarok and The Man Who Invented Christmas in theaters. I got 100% on my very first math test for math 123. To be fair, the test was probably only 11 questions. We got Boo Boo a fountain he can drink from instead of the kitchen sink (which he still manages to do, anyways). My cat-loving friends will appreciate the significance of this. Mason and I started rebuilding our lives together. We received two Christmas cards this year, one invitation to a Christmas Eve party which we’ll attend, and one for a New Years Eve party which we’d like to attend. That’s +2 parties more than we were invited to the year before. One Tree Caramel Cinnamon is amazing, but expensive. Close to $8 a bottle. I’d rather pick up a 6-pack of Angry Orchard Cinnful Apple for that price (which I did: yesterday, to celebrate the end of the Fall semester). Wild turkeys visited our back yard; the cat was not impressed. We bought a Starfinder book and thought about playing. My mother got a nosebleed that didn’t stop for three days. Four (five?) emergency room visits later, a lot of blood, and our visit to Montana wasn’t quite the same. We looked at a piece of property hidden somewhere in Spokane and imagined living there in a manufactured home shared with my parents. The property has already sold. Mason convinced me to see Star Trek II: The Wrath of Khan when it returned to theaters. I was not disappointed. Mason and I attended Portland Retro Gaming Expo at the invitation of new friends. I spent an odd amount of time with a boy, who possibly talked more than I did. He wore a black velvet suit jacket and Converse sneakers. The boy is going places, not the least of which was straight for my heart. We played a lot of arcade games, and bought lots of old games. I signed up for my first ever “Virtual Run” with a dear friend. Sometime around Halloween we walked around the mall while listening to a special episode of “Zombies, Run!! !” which seemed fitting, being in the mall. We received medals in in the mail for our completion. We watched Stranger Things Season 2, The Punisher and half of Orville: all of which I loved. In school, I heard author Lenya Krow and poet Ben Cartwright read aloud. Cartwright joined us later in Poetry class and read us poems inspired by the time he once lived in China. October 27th, 2017 - my mother's birthday: she officially retired from Big Dog Coffee. I expressed my dislike of “The Name of the Wind,” to no less than a dozen people. I still feel like I’m the only person in the world who dislikes Patrick Rothfuss. I also caught a favorite author being rude on social media about political ideas and am reconsidering how I feel about them. There is a term for this, I think? An association between the author and their bodies of work and being unable to separate your opinion of one from the other. I bought and played 20 minutes of a Playstation 4 Kingdom Hearts collection. Silly me thinking I could play video games and do school stuff. I haven’t made it back to play since. Boo Boo learned how to knock Mason’s Star Wars books off his book shelf and on to the floor. Which he now does repeatedly. Since my sister Stephanie moved to Boston and left her Xbox One with her mother—we hadn’t been playing Minecraft like we used to. We attempted to play a few You Don’t Know Jack games, Starbound (on PC) for a round or two, an awful few games of Rocket League and Don’t Starve Together. We finally decided that Minecraft is the best game for the three of us to play, and so we’re back to Minecraft on Thursday nights and everything is right in the world: except I’m still considered a third-place friend on Facebook. One Sunday morning, Mason quietly stood by the bed and said: “Michelle, you need to wake up, I have something important to talk to you about.” Those are the words of someone who is in shock. I immediately woke up. “My truck is gone.” He went out to do laundry—and noticed his truck was missing from the parking lot. There’s no chance it had been towed: our landlady is familiar with everything that belongs to us. Mason’s truck had been stolen. Mason introduced me to Animal Crossing on my 3DS and I play it weekly. Stinky is my favorite character (he’s a cat with wrestling shorts on his head). I think we ate a total of 30 pies this Fall Semester. I gained my weight back from the summer. I have no idea what happened. I started (and am still doing the audio book version of) The Wind-Up Bird Chronicle by Haruki Murakami. I’ve never been more fascinated and repulsed by reading a book and I can’t stop reading… I’m learning things about craft and characters (from Station Eleven and Kraken also), things that cannot be undone. I was also supposed to read The Road by Cormac McCarthy but ran out of time. I sweated over every single paper I wrote for English 102. I respect all of my teachers for their patience, their attitudes, attention to detail and the care they bring to the classroom. Every teacher I’ve encountered at North Idaho College has handled me with care. This teacher, who I also call friend, carefully guided me through the class knowing that analytical papers are not my area of expertise (neither are commas). I can’t really claim anything as my area of expertise except for maybe sarcasm and destroying relationships. My teacher challenged me, and helped me meet the challenge; even if I ended up in a pile of “I can’t do this,” after my first paper. It’s just nice to know that teachers care—not just about their student’s grades, but their lives, and how they’re doing with classes. It’s encouraging when a teacher cares, and it really does make all the difference. The sweat and tears of frustration this semester could easily have turned to those of defeat—and they did not. Thank you. 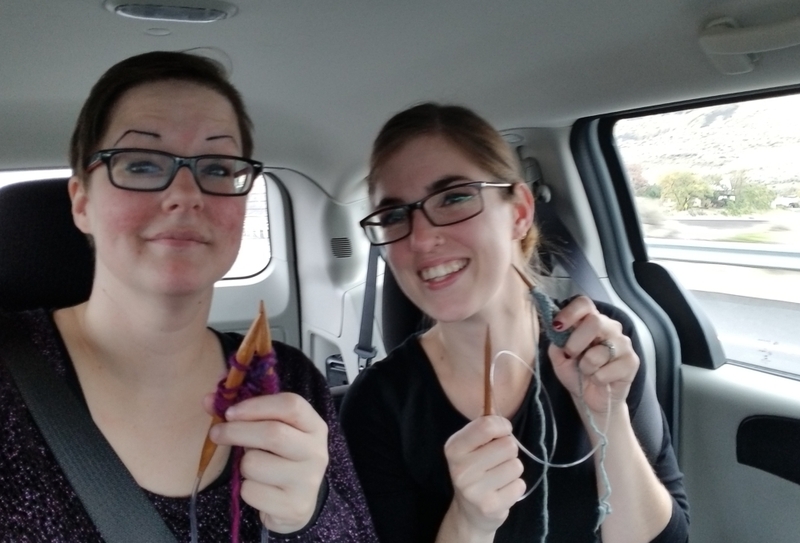 A new friend tried to teach me how to knit. It did not go well. North Idaho College English Club took me on a brief trip to Portland to attend the biggest book festival I’ve ever seen. Some 10,000 people frequented the Portland Art Museum and surrounding areas for Wordstock. I got to see Jeffrey Cranor and Joseph Fink (of Welcome to Night Vale), and they signed my copy of It Devours! Seeing the Editors Guild there really helped me to consider what I'd like to pursue as a day job once I have my degree. I bought Mason a handsome rooster shirt. I encountered a public write-in by a Portland non-profit called Literary Arts. I wrote things but did not share. My English teacher wrote a poem about knitting (see above). Eventually we asked a friend to run a Starfinder campaign and have been playing every Monday night for the last few months. It’s been lovely. Monday nights are nights to be dreaded—and we always end up rolling with laughter; our gaming group is a good one. It is a much-needed mending time. At some point the truck was recovered, and our insurance company reimbursed us for our losses. We purchased a 2002 Volkswagen Passat from a mechanic (thanks to the sleuthing skills of another dear friend) with only 85,000 miles on her. She’s a beautiful car, a kind of pale gray-green and came pre-installed with a Powell’s sticker on the window. My Honda Civic gets close to 40 miles to the gallon, and this new baby gets somewhere around 25 so it’s hard to adjust to it. Mason and I plan on trading off driving her. We’ve used a club on her steering wheel ever since we brought her home. We went to the first Poetry Night at DOMA Coffee in Post Falls. We discovered our new Passat has a randomly-honking horn. At some point during the semester, I learned of a class being offered in the spring that would allow for a trip overseas. My tenure at North Idaho College is about as high as it can get so I knew I’d be first on the list if I wanted to get in; and so I did. I’ve since gotten my passport, and paid my deposit for the trip. In May 2018 I’ll be heading to England, Scotland and Wales with two faculty members and 17 other students. Mason can’t come with me, and that’s the hardest part about this whole trip (aside from a 9 hour flight to London and no cat). I’ve only ever been to Canada before, and I’m terrified of flying. It hasn’t really hit me yet, you know? We had Thanksgiving with Mason’s parents and both of his children showed up. Nothing caught on fire, and I was even sober (I drank and entire bottle of wine but it was over the course of the day). We found a giant deck of UNO card and played with my parents. For the sake of Mason’s daughter—we watched Pitch Perfect. It was an OK film, funny enough, but too much gross humor for me. At his daughter’s insistence: we watched the second one, which was better. And, I imagine, we’ll see the third one in theaters in December. My grandfather passed ago a year ago in November. He liked playing UNO. North Idaho College had their first annual Book Flood inspired by an Icelandic tradition. I donated copies of Sabriel and Station Eleven. I managed to convince my English teacher he should read Station Eleven, and he said he did and that he liked it. I hope he also reads Sabriel. I helped organize SpoCon’s first fundraiser at a local restaurant called Poole’s Public House. The food was delicious and the staff was kind. We made $94 to help with SpoCon 2018! Christmas money helped us buy our memberships to both SpoCon and RadCon. We’re nerds with priorities. We also picked up Betrayal at Baldur’s Gate, and Xbox One games: Star Wars Battlefront II (for Mason) and South Park: The Fractured but Whole (which should make you laugh every time you read that title out loud, just sayin’.) I’ve finally had enough time to sit down and play some video games and… holy goodness, but South Park makes a damn fine video game. I’m semi-addicted to Animal Crossing: Pocket Camp. Of the 10,000 words I wrote for my Independent Study workshop, about 7,000 made the re-assembly draft. I plan on sharing it here eventually, I’m quite happy with it. My teacher (different from English 102) wants me to keep writing, and to check back on the manuscript around the 20k point to make sure the characters are going in the right direction. A squirrel wished me good luck before my math final. We watched half of The Force Awakens, and then saw The Last Jedi in theaters last night. No spoilers from me—but it is a great movie. We’ve got Mason’s Christmas party this weekend, and then a week-ish trip to Montana. We’ll be packing Boo Boo with us and having Christmas with my mother, Muskrat, step-sister, her boyfriend and two young children. I’ll be bringing alcohol. As Christmas gifts, I’m officially “that aunt.” I bought her kids books. My parents didn’t buy me books for Christmas to my memory (not their fault, just different priorities); but my aunts I remember getting The Dreaming Tree by C.J. Cherryh for Christmas from my aunts when I was young. Little did I know that I’d later live in the same city as Cherryh, but she also helped my favorite author Mercedes Lackey write her first novel: Arrows of the Queen. I’ll be applying to Eastern Washington University of Christmas break. Copyright © 2019 Michelle Brumley.